The top sheet happened to be the negative from a Spellbinders cut so it served as the perfect frame. I stamped the sentiments using my Versafine brown ink onto some My Minds Eye design paper and then cut it out with my die and I happened to remember I had those "Want to Scrap" bling stickers that fit my die perfectly. I inked all my edges with Vintage Photo distress, glued down some sweet rose colored ruffled netting trim and some twine leftover from a clothing tag and then punched out a few bunting/banner shapes with my Fiskars Jenni Bowlin hand punch. Lastly I stuck down a Jollee's sticker Embellishment. And decorated a bit inside the card. 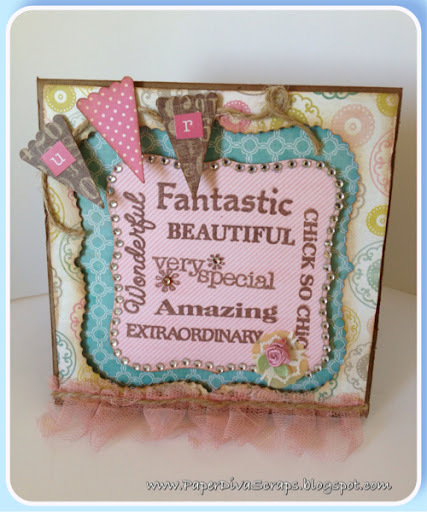 Fabulous card... love that netting ruffle!! Thanks for sharing at In The Pink this time.. hope to see you here again soon with another gorgeous pink creation! Lovely card. Sweet papers and awsome details. 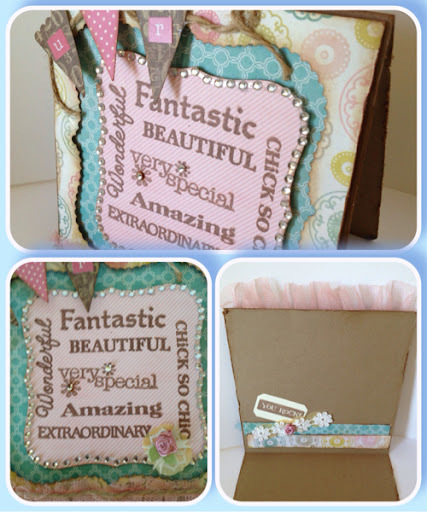 Thanks for joining us at Paper Crafting Journey. Gorgeous card with lovely colors and a fab design! Love it! WOW! What a great card! I love how you've used all the sentiments together like that, with the little "u" and "r" on the banner - excellent idea! Thanks for joining us at IBSIC!